The two protagonists of the next game are Crystal and Noelle and both have opened an Instagram account to become fashion influencers, and especially specialize in bikinis and swimsuits for the summer. In this game we will have to offer them challenges, and dress them according to the challenge they have faced. They can be thematic like for example tropical swimsuits, with print, of two colors, etc. We will try to dress them as well as possible so that they achieve their goal and then we will prepare the photo they will upload to the networks. We will have to select the pose, a filter and everything else to be very professional. Then we will see how we will earn money and the comments of our first fans, to get more clothes and things to edit the photos in this social media adventure. 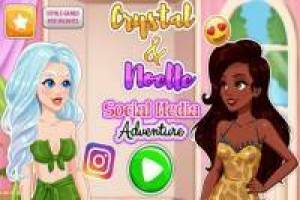 Enjoy the game Crystal and Noelle: Social Media Adventure, it's free, it's one of our Top model games we've selected.